The Fed meeting minutes publication caused the different directional movement within the euro/dollar, the euro ended session nearly on the opening prices. We should pay attention to the preliminary Purchasing Managers’ Index assessment (PMI) for the manufacturing and the EU leading countries service sectors and the euro area as a whole. The Germany and France PMI indices are expected to be improved in both sectors; however, the French figures are still low below the level of 50.0. The pair traded with a positive attitude while remaining within a narrow range. 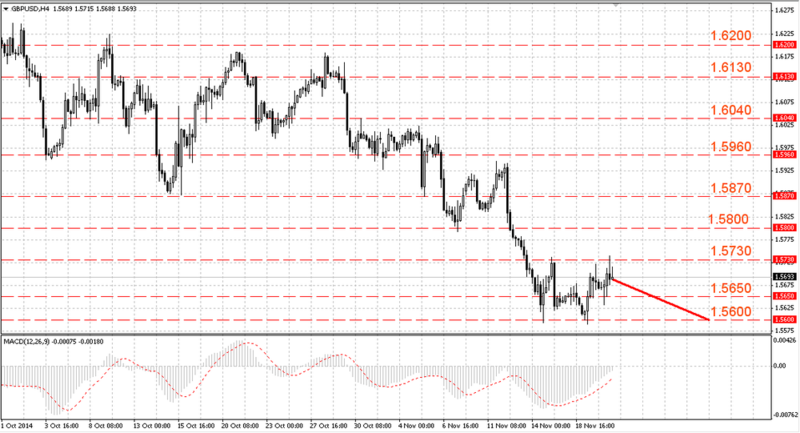 Its attempts to break through the resistance level of 1.2580-1.2600 were unsuccessful. 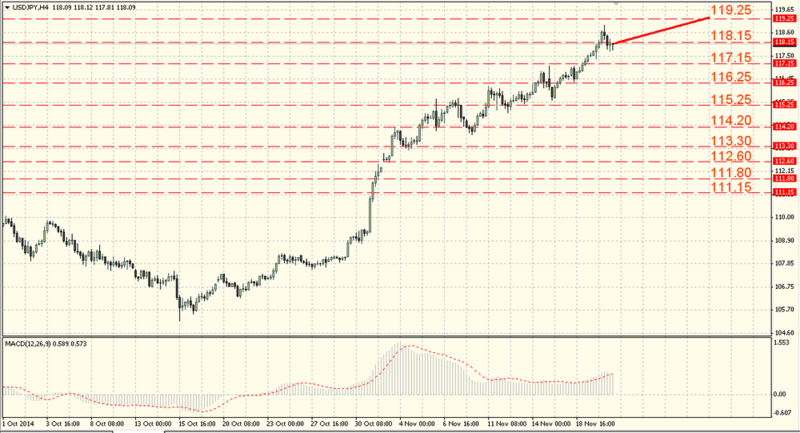 The support levels are 1.2480-1.2500, and the resistance levels are 1.2580-1.2600. MACD is in a positive territory. We should consider its ability to consolidate above the resistance level of 1.2580-1.2600 as a good signal, so we do not have to exclude the resistance level of 1.2660-1.2680 breakthrough. The British pound was supported by the Bank of England Committee monetary Policy last meeting minutes release. The UK retail sales for October will attract traders’ attention, we expect its growth by 0.3% m/m and 3.8% y/y vs. -0.3% m/m, + 2.7% y/y in September that is obviously a positive factor for the pound and can support it. 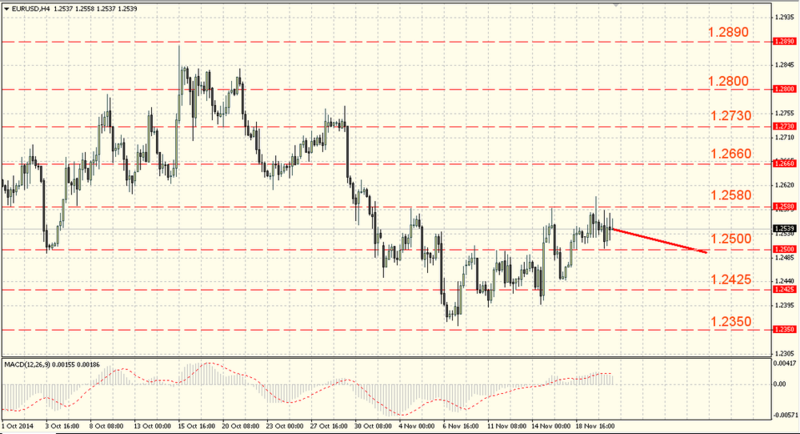 The pair rebounded to the resistance level of 1.5730-1.5750 after the support level of 1.5630-1.5650 testing. The pressure on the pair and the renewed fall risks are still preserved. The support levels are 1.5630 – 1.5650, and the resistance levels are 1.5730 – 1.5750. The loss of the level of 1.5630-1.5650 will lead to a reduction to the 56th figure and its breakthrough will allow bears to test the 55th figure. The Japanese yen has been declining against the dollar but it succeeded to regain some losses. The Japanese economic news showed uneven results, but, in general, the news is not bad – the foreign trade negative balance declined to -710.0 billion in October against 960.6 billion yen earlier, the business activity index in the manufacturing sector slowed in November to 52.1 from 52.4 after the expected growth to 52.7 and equipment orders fell to 30.8% y/y in October after 31.2% y/y in September. The Japanese yen was declining that is clear and predictable. Against this background, the dollar/yen was rising higher and higher, reaching at the moment the level of 118.60. The pair is trading at the support level of 117.95-118.15 area. The support levels: 117.95-118.15, and the resistance levels: 119.25-119.45. The psychological level of 120.00 can be tested in the short term where we should expect the bears’ activation. The overbought pair can cause rebounds and from the resistance level of 119.25-119.45.